When I drive U.S. Highway 95 through North Central Idaho, I often stop near the top of White Bird Hill. A shelter there overlooks the battlefield where Nez Perce braves tangled with the U.S. Cavalry in 1877 before taking their epic flight toward Canada. If you’re reading this, you know Ken served in Vietnam. He and his wife, Betty, created the “Bravo!” documentary about the siege of Khe Sanh, capturing the memories of Ken and the other Marines who survived those 77 hellish days. They travel widely to screen the film. I know Ken and Betty because I’ve been on a similar journey, giving readings from the Grady Myers memoir “Boocoo Dinky Dow: My short, crazy Vietnam War.” The title comes from the way American soldiers pronounced beaucoup dien cai dau, a French-Vietnamese expression that meant very crazy. Off the wall. I was married to Grady during the 1980s. Like Betty, I was the wife who decided those war memories should be preserved. 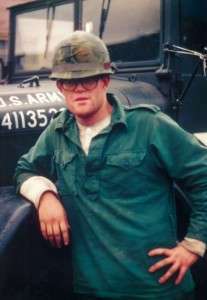 Besides, as a journalist, I knew a good story when I saw one: A funny, artistic and nearsighted Boise teenager is transformed into Hoss, an M-60 machine gunner who nearly dies in battle. I was the scribe for “Boocoo Dinky Dow.” Grady, a professional artist, provided illustrations. After he died in 2011, I published the book. I found it satisfying to honor a talented man, the father of my son, by making his experiences part of the Vietnam War literature. “Boocoo Dinky Dow” is in the Vietnam Veterans Memorial archives and Texas Tech’s Vietnam Archive. It has found its way into libraries and veterans’ centers, has been discussed in book stores and living rooms. Grady’s war-related artwork is now in the permanent collection of the National Veterans Art Museum. Publication did more than end a decades-long book project. It started a personal journey. My life is richer for the torrent of stories coming back at me in return for sharing Grady’s. I’ve heard stories from Marines, Navy and Army vets. But also from nurses and protesters and USO performers. And COs who were conscientious objectors and COs who were commanding officers. And pilots and submariners, professors and cops. And women who waited for brothers and sons who came back unscathed, at least on the outside. I’ve talked to people forged by war and people broken by it. Even the stories I don’t hear intrigue me. At “Boocoo Dinky Dow” readings, I’ve learned to watch for the guy at the back of the room, a guy in his 60s. He sits there, arms crossed, maybe nods a time or two. As others in the audience come up to chat, I look over their shoulders and see him head out the door. Can he not bring himself to talk about what he did in the war, having suffered what journalist David Wood calls “moral injury”? Maybe he doesn’t feel worthy of recognition. Or doesn’t think he’ll get it. One combat vet told me, “I don’t want to be thanked for my service. I didn’t want to go. I was drafted.” Two sentences later, he was explaining how he worked hard not to resent Iraq and Afghanistan vets for having been welcomed home by the public. Mixed emotions and complexity are the hallmarks of this war-story enterprise. How must it feel to have watched buddies die in a war that became a synonym for failure? Last time I Googled the words “another Vietnam,” there were 143,000 results. I feel plenty of confusion myself. I grapple with the increasing awareness that, in addition to horror and waste, war yields friendship, pride, and the occasional vanquishment of evil. War is a stage for both despicable crimes and crystalline acts of conscience. As Grady’s memoir and the “Bravo!” documentary show, war can inspire art. When Ken told me that “nobody hates war more than a soldier,” he was responding to some angst I shared with him. I was fretting about the fine line that exists between honoring warriors and promoting wars. I didn’t want to step over that line. Frankly, I’m still not sure where it is. But Ken is right. Most combat veterans fully understand the words that Chief Joseph of the Nez Perce tribe said in surrender. That he was tired of fighting. That he would fight no more, forever. Julie Titone’s articles and photographs have appeared in regional, national and international publications as well as college textbooks and literary collections. She lives in Everett, WA. 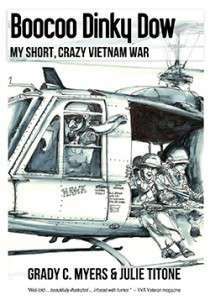 To learn more about the authors of “Boocoo Dinky Dow” and to order the book, visit shortcrazyvietnam.com. We needed help finding the train, what is officially termed the CTA, the Chicago Transit Authority, from Midway Airport into downtown Chicago. We had notions about traveling on the system but really had no idea how you actually got it done. Was it like New York’s subway? Were we going to get held up or witness a shooting and what about the weather? Hot and humid? Tornadoes? Our concerns were initiated by what we see on the national news. At the airport we found the information desk and the man behind it wore a Khe Sanh Veterans ball cap. He was lean and fit and confident. Betty started our conversation with him by saying I had been at Khe Sanh. We shook hands. What a strong grip he owned and I asked him his unit. His name was Rich, and he served with the Third Battalion, Third Marines. I said, “1/26.” He nodded and then proceeded to explain how one gets from Midway to the Orange Line and from there to the Brown Line. He told us we were going to love Chicago. And we did love Chicago. The big-muscled hubbub, the Midwest practicality, the friendliness, the food. We met up with our Internet friends who are now our real friends, the writer and teacher Patricia Ann McNair and her husband, the visual artist and writer Philip Hartigan, and they showed us some of Chicago’s famous neighborhoods and points of interest and we had Vietnamese, German and Italian food. We attended literary events. I even read from my book of short stories at one of the readings and we got to hear Chicago author and professor Eric May read from his new book. 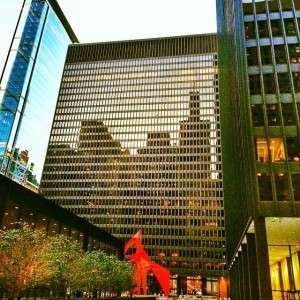 Both Eric May and Patricia Ann McNair are professors at Chicago’s Columbia College. Betty and I visited their writing program offices and were impressed with the faculty and staff we met there. The buffet at the ULCC screening. 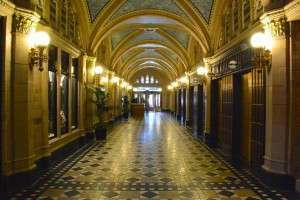 We were graciously put up in a grand room at the Union League Club of Chicago (ULCC), where we met former Navy pilot Jan Donatelli, the major force behind the screening event, and the ULCC’s Kathy Hurley whose herculean efforts made our stay and our screening there a tremendous success. We offer our thanks to the ULCC’s executive director of Public Affairs, Mr. David Kohn, who made sure we received a warm welcome when we checked into the hotel. 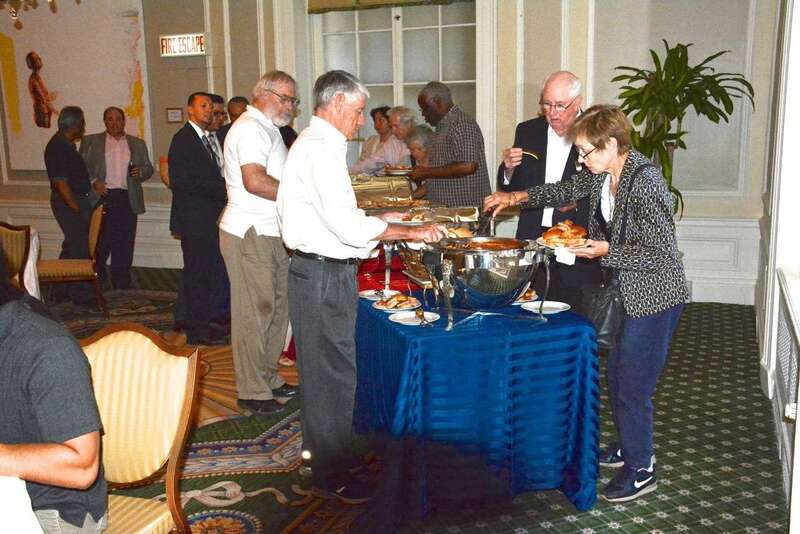 We were invited to the regular luncheon of Union League’s American Legion Post 758. A big thank you to Post Commander Matt Iverson for making sure we had an excellent meal and reception, and to boot, the post underwrote a significant portion of our travel expenses. 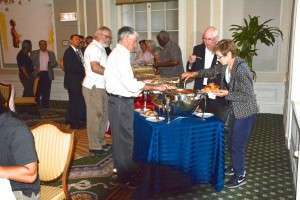 They hosted our screening, as well, which included a sumptuous buffet for those who attended. One of the other major sponsors of our trip was the Pritzker Military Museum and Library. 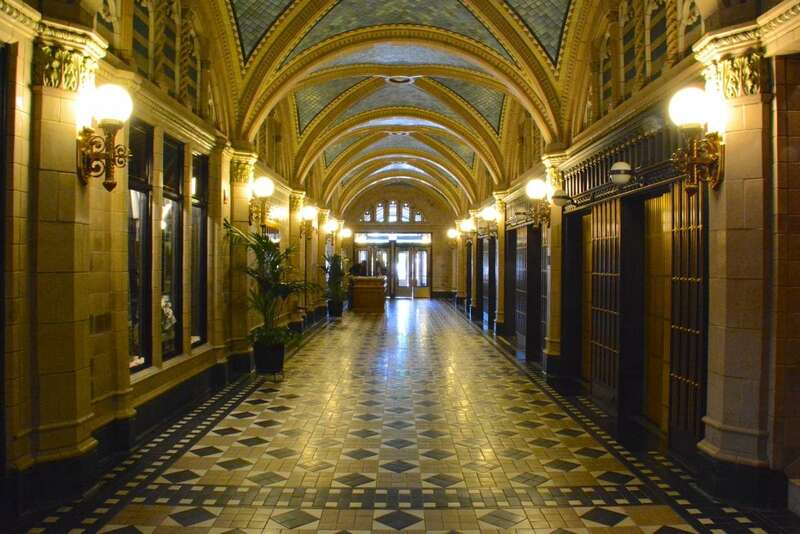 The Museum, housed in a beautifully restored building in the heart of downtown, is a cache of American veteran memorabilia, research material, books, movies, photography, and more. At the time of our visit, they sported an impressive exhibit on United States Navy SEALs. Mr. Kenneth Clarke, the CEO of the Pritzker, personally greeted Betty and me. While there, we found the copy of BRAVO! which had been donated by the Paddock family, and I gave them an interview for their oral history project. I originally said I was interested in talking for an hour or so about my experiences at Khe Sanh, but ended up reminiscing for three and one-half hours. A big thanks to Mr. Thomas Webb and Mr. Jerrod Howe of the Pritzker, both for scheduling the time to interview, and for conducting the interview. Jerrod Howe is in the Cinema Arts and Sciences MFA program at Columbia College. The screening was well attended by old friends and new friends. BRAVO! Marine Michael E. O’Hara came all the way from Indiana to share some time with us and participate in the Q & A following the screening. Another distinguished guest was Tom Eichler, who served during the Siege of Khe Sanh with Echo Company, 2/26. Tom was awarded the Silver Star for some of his actions during the Siege. He is also the president and treasurer of the Khe Sanh Veterans Association. Both Tom and the association have been strong supporters of our efforts to make and screen BRAVO!. One of the great things about traveling around the country, screening the film, is how old friends show up in new contexts. Betty has known Mr. Donald Hovey for four decades. 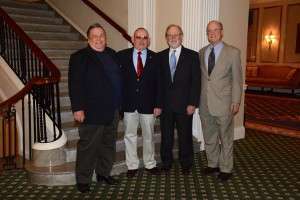 They met in New England and have remained friends all the intervening years. Donald is a tenor and agreed to sing the national anthem at our ceremony and he did a fantastic job to much applause. Finally, we wish to thank our Cowboy Poetry friends, John and Judy George, members of the Union League Club and the folks who initiated this BRAVO! debut in Chicago. Also, kudos to Colonel Jennifer Pritzker who helped sponsor our trip to Chicago, and to esteemed Medal of Honor recipient Mr. Allen Lynch for attending the screening. We also wish to express our gratitude to the evening’s emcee, Mr. Bill Wigoda, and to Vietnam War author Julie Titone who helped pave the way for this memorable experience on our BRAVO! journey. 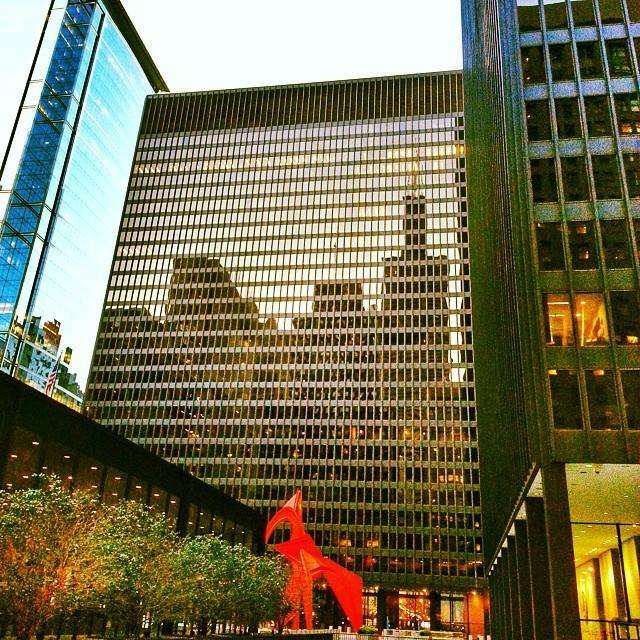 We began our trip to Chicago not knowing what to expect, but we can say without hesitation that we loved the city and the residents there. We hope to return. BRAVO! has a page on Facebook. Please “like” us and “share” the page at https://www.facebook.com/Bravotheproject/. It’s another way you can help spread the word about the film. The screening of BRAVO! to nearly two hundred attendees last week in Moscow, Idaho, co-sponsored by the University of Idaho’s Operation Education and the Department of English, was an amazing experience for co-producers Betty and Ken Rodgers. We were enthusiastically received and got to taste the flavor of campus life at the University of Idaho. We were received on Wednesday evening by our hostess, journalist and author Julie Titone. 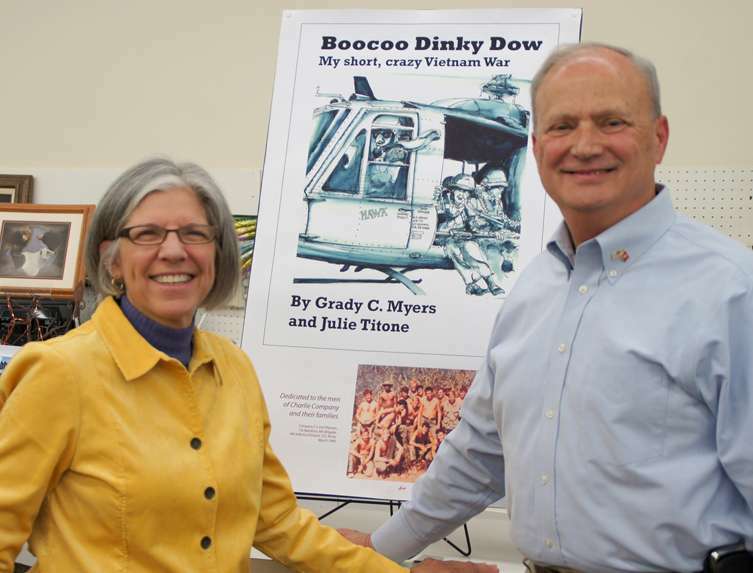 Julie, along with her former husband, the recently-deceased Grady Myers, co-authored a book about Vietnam titled Boo-Coo Dinky Dow, My Short Crazy Vietnam War. You can find out more about the book here. Thursday morning, Betty and Ken met with Ed McBride of Operation Education and talked about the upcoming events in which they were to participate, followed by a stimulating session with Dr. Anna Banks’ documentary film class where we showed clips of BRAVO! and had a great discussion with the students. For lunch, Betty and I enjoyed the succulent Sublamb gyros from Mikey’s Greek Gyros on Main Street in Moscow. From there, we met with Laura Pizzo of the English Department for a Q & A session with students of the university. We talked about art, writing and how to simultaneously maintain both a non-writing career and a writing practice. After that we met with Christine Cavanaugh at the beautifully restored Kenworthy Performing Arts Centre to make sure that BRAVO! would look and sound just right for the following evening’s audience. 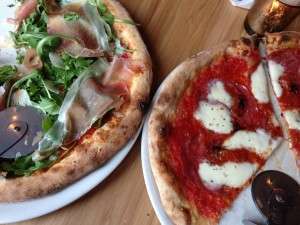 We finished up the evening with elegant pizzas—yes, elegant—from Maialina Pizzeria Napoletana just down Main Street from the Kenworthy. 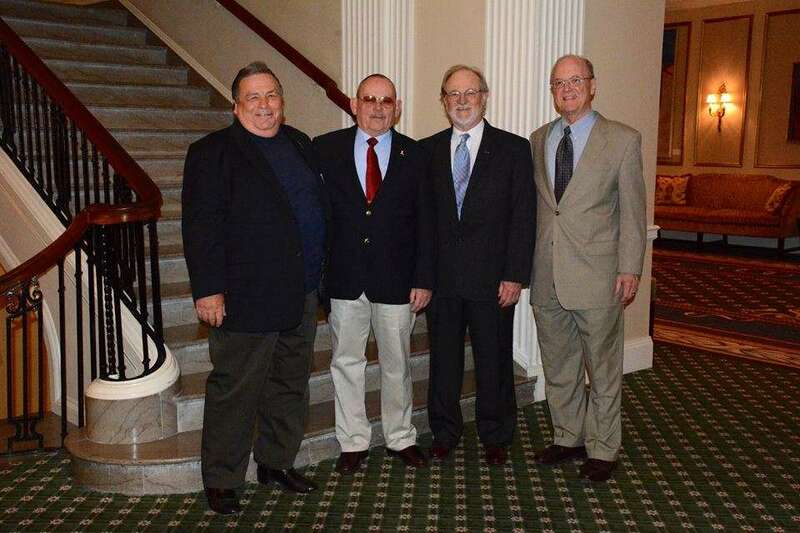 Friday, April 19, we enjoyed lunch with Ed McBride, Dan Button, and members of Operation Education’s advisory council. We also met five disabled veterans of this country’s current conflicts, and it was inspiring to hear these young people talk about how they are overcoming the difficulties they endure as a result of their service in combat zones. Among the tools they use to move forward in life are the educational opportunities afforded by Operation Education and the University of Idaho. Betty and I then met with a small crowd of listeners at Moscow’s independent bookseller, BookPeople, where we had a discussion about turning the pain of war, the pain of life, into art. Ken read selected poems from his books of poetry. Mark Spear, principle videographer for BRAVO! and BRAVO! Marines Ron Rees and Mike McCauley joined us for the screening that began at 6:30 PM with an introduction by Dr. Brett Morris, retired Colonel in the United States Air Force and current Director of Internal Strategic Communication at the university. First off was the presentation of the colors by the color guard from the Joint University of Idaho-Washington State University ROTC programs. This was followed by an a capella singing of the National Anthem by University of Idaho MFA candidate in Creative Writing, Sarah B. Barrett, whose father served in Vietnam. Moscow’s Mayor Nancy Chaney welcomed both the audience and the filmmakers to the community, and was followed by University Vice-President of Advancement, Chris Murray, who welcomed the attendees on behalf of the University and Operation Education. Filmmakers Ken and Betty Rodgers then talked briefly about the film. After the screening, members of the film’s audience and a panel moderated by Dr. Morris discussed war in its many aspects, past, present and future. The panel talked about war and film, war and memory, war and guilt, war and PTSD. Members of the panel (all Marines with combat experience) included Latah County Magistrate William Hamlett, Retired Marine Corps Colonel Bob Wakefield, Mr. Paul Warmbier who is a teacher in the Moscow school system and Marine veteran of the battle of Fallujah in Iraq, and BRAVO! Marines Mike McCauley and Ken Rodgers. Many thanks to Kim Barnes, Professor of English at the University of Idaho, for her vision, drive and attention to detail that made this screening and its related activities possible and successful. Thanks, too, to others who helped make the BRAVO! screening a success, including UI’s Karen Hunt, Kate Cobb, Max Eberts, Kelly Roberts and Laura Zak, as well as Jennifer Bauer of the Lewiston Tribune/Moscow-Pullman Daily News. The day after the events at Moscow, Ken and Betty took a needed day off and toured the country–the magnificent Palouse including views from Steptoe Butte, multiple teams of draft animals plowing and harrowing west of Colfax and a visit to thunderous Palouse Falls. Next up for BRAVO! are two screenings in Sonora, California, at Columbia College on May 18 (Armed Forces Day), 2013. This screening is sponsored by Vietnam Veterans of America Chapter 391, Columbia College, and Mike Preston who is a veteran of the Siege of Khe Sanh and a lifetime member of the Khe Sanh Veterans. 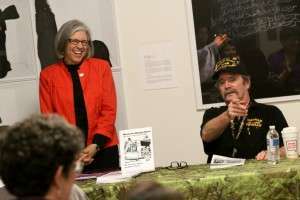 More details on the Sonora screening at http://www.vietnamveterans391.org/. Here’s the info on the screening of BRAVO!, COMMON MEN, UNCOMMON VALOR in Moscow, Idaho, on April 19, 2013 at 6:30 PM. 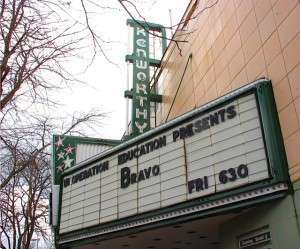 Screening is at The Kenworthy Performing Arts Centre at 508 South Main Street, in Moscow. Doors open at 6:00 PM. There will be a panel discussion on aspects of and the nature of war across generations and conflicts. At the screening you will be able to meet the filmmakers, Ken and Betty Rodgers, the film’s principal videographer, Mark Spear, as well as Mike McCauley and Ron Rees, Bravo Company Marines who are in the film. This screening of BRAVO! is sponsored by the University of Idaho’s Operation Education and English Department, and is free of charge but donations to Operation Education are strongly encouraged. Operation Education assists disabled combat veterans in attaining a college degree. You can find out more about Operation Education at http://www.uidaho.edu/operationeducation. Thank you to the Kenworthy Performing Arts Centre (http://www.kenworthy.org/index.html), Ed McBride and Dan Button of Operation Education, and Kim Barnes and Laura Pizzo from University of Idaho’s Department of English, and Julie Titone for making this screening possible. Here is a 2 hour first run movie like you will never see anywhere else, not at any theater, it is shown only privately. This film was made by Ken Rodgers (and his wife Betty), who lived the whole experience with Bravo Co, 1st Battalion, 26th Marines. This is about the 77 day siege of Khe Sanh starting 21 January 1968; the Tet Offensive. It also covers the ill fated “Ghost Patrol” of 25 February and subsequent action in retaliation such as ”The Payback” battle on 30 March which was the only Marine Corps bayonet charge in Vietnam history and the only one since World War 2. Less than 100 men participated and 19 were KIA . There were over 100 Purple Hearts earned that day, some men having multiple wounds . Other awards were 2 Navy Crosses, 8 Silver Stars , 9 Bronze Stars with “V”, 2 Navy Commendations w/V. One hell of a heroic day! There are 15 Marines interviewed who are participants in the film itself. These guys are the “been there done that” gang, common men, uncommon valor. This film has a lot of historical significance, being about the longest and biggest battle of the 10 year conflict. Seating is limited to 400 tickets max. Tickets are $10.00 and are available on line at Vietnam Veterans of America #391 for each of the two showings at 5:00 PM and 8:00 PM at Columbia College. There are also 3 trailers to see from the Bravo website. Just click below. If tickets are sold out and if you show up at the door at show time and there are any no-shows, you will be seated. All email tickets will be ”will-call” at the door. Tickets will also be available at Columbia College: Call Michelle Vidaurri at 588-1505. In Calaveras County, contact Bravo Project chairman Mike Preston @ 795-1864. Tuolumne County, contact Carol Southern at 938-3848. Please send this to all who may be interested. On the Fresno and Clovis Screenings of BRAVO! Last Wednesday and Thursday BRAVO! was screened to several hundred enthusiastic and earnest viewers in Fresno and Clovis, California. On Wednesday the film was shown at the Fresno Veterans Affairs facility and on Thursday BRAVO! screened twice at the Clovis Veterans Memorial District’s state-of-the-art theater. The screenings went well and were attended by veterans old and new, active duty military personnel and folks interested in the history of Khe Sanh and the Vietnam War. Lt. Colonel Ken Pipes, USMC Retired and commanding officer (Skipper) of Bravo Company during the siege of Khe Sanh, came up from Southern California with his wife Sharon to help us out with the screenings. Skipper Pipes graduated from Clovis High School and attended Fresno City College and then graduated from Fresno State before being commissioned as a second lieutenant in the United States Marine Corps. Before and after each screening, the Skipper graced us with his memories of Clovis and Fresno as well as Marines he knew from the area. The Skipper also waxed eloquent about the men of Bravo Company. We were also fortunate to meet some of Ken Pipes’ wonderful family. Khe Sanh brother Alex Dominguez came up from the Los Angeles area and presented BRAVO! co-producer Ken Rodgers with a commemorative Marine Corps Silver Dollar and a beaded Vietnam Veteran wristband. Alex is a great supporter of the film and a good friend to Marines everywhere. One of the best things about journeying around America introducing the film to audiences is the folks we meet, and we met some great people in Fresno and Clovis including martial arts expert Captain Ed Planas of the Joint Service Honors Command, and Mr. Miguel Saldana, a Marine veteran of the Iraq War and president of the Student Veterans Organization at Fresno State University and his compadre, Army Iraq War veteran Rolando Corral. Also attending were a contingent of about thirty active-duty Marines from Lemoore NAS who gave BRAVO! a standing ovation. A big thanks to the Joint Service Honors Command, the Clovis Veterans Memorial District and their event specialist, Mr. Joel Diaz. Thanks too, to Fresno area Detachment #14 of the Marine Corps League, Veterans of Foreign Wars Post 3225, American Legion Post 509, American Sheet Metal, the Fresno VA, Peak Broadcasting for the public service announcements, Kaweah Covenant Group and Mr. Leroy Combs of Ideas Unlimited Printing for the beautiful posters. Khe Sanh brother Dave Harper was responsible for setting up these screenings and a big Marine OOORAH is in order for his yeoman’s efforts in bringing the screenings about, and for his generous hospitality. Dave’s vision and tenacious attention to detail led to these very successful screenings. Next up, April 19 at 6:30 PM in the Kenworthy Performing Arts Center in Moscow, Idaho. Sponsored by the University of Idaho’s Operation Education. Thanks to Kim Barnes, Laura Pizzo, Ed McBride, Dan Button and Julie Titone for their support on this event. In the mix for upcoming screenings, a May 18 screening in Sonora, California. May 18 is Armed Forces Day. Thanks to Khe Sanh brother and organizational dynamo Mike Preston for his efforts to bring this screening about. We have terrific news to announce about upcoming screenings of BRAVO! COMMON MEN, UNCOMMON VALOR in March and April, 2013. If you want to see BRAVO!, meet the filmmakers, meet other veterans and interested folks, then consider coming to one of these screenings. We’d be pleased to see you there, and you are welcome to invite others and help spread the word. On March 12, BRAVO! will be screened on the campus of the University of Nevada-Reno in the Wells Fargo Auditorium in the Library and Knowledge Center. Sponsors for this screening are the University Veterans Club, NuPhi Vets, and the Reno chapter of the Vietnam Veterans of America. There will be a reception beginning at 5:00 PM followed by the University Veterans Club panel introductions. The actual screening will begin at 6:00 PM followed by a panel discussion. Many thanks to our Marine brother, Terry Hubert of the Vietnam Veterans of America, for all his hard work in putting this screening together. On March 20, 2013, BRAVO! will screen in the auditorium at the regional facility for the Department of Veterans Affairs in Fresno, California. Doors open at 4:00 PM. The VA is located at 2615 E. Clinton Ave (at the corners of Clinton Avenue and North Fresno Street) in Fresno. Thanks to Khe Sanh veteran Dave Harper for arranging this screening. On March 21, 2013, BRAVO! will be screened twice at the Clovis Veterans Memorial facility 808 4th Street in Clovis, CA, once at 2:00 PM (doors open at 1:30) and again at 6:00 PM (doors open at 5:30). These screenings are sponsored in part by the Joint Service Honors Command, the Fresno area Marine Corps League, American Legion Post 509, Veterans of Foreign Wars Post 3225 and again, our Khe Sanh brother, Dave Harper. On April 19, 2013, BRAVO! will be screened in Moscow, Idaho, at the Kenworthy Performing Arts Center at 508 South Main in Moscow beginning at 6:30 PM, and followed by a panel discussion. This screening is sponsored by the University of Idaho’s Operation Education, which honors and assists permanently disabled veterans of war to gain a college degree. You can find out more about Operation Education at http://www.uidaho.edu/operationeducation. Thanks to Mr. Ed McBride and Mr. Dan Button of Operation Education and Laura Pizzo, Project Coordinator for the Department of English at the U of I, for their efforts in bringing BRAVO! to Moscow and the University of Idaho. Special thanks to award-winning memoirist and novelist Kim Barnes, Professor of English at the U of I, for her energy and commitment to BRAVO!. Further thanks to writer Julie Titone for her assistance with our visit to Moscow. Any changes or additions to the information on these screenings will be sent out as soon as we know about them. We are now facing major expenses involved with licensing and DVD production. We would appreciate your help in finding a sponsor (a business or organization) who will help cover these expenses in exchange for listing their name as a sponsor in all promotional materials and on the DVD.